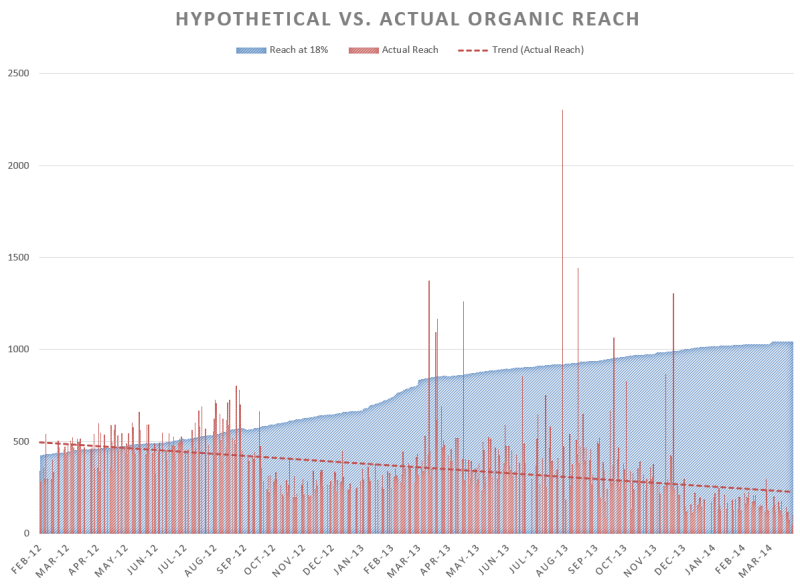 So far coverage of Facebook's plan to squeeze the organic reach of Pages has focused on its impact on "brands" that spam us with ads and promotions. But nonprofits, activists, and advocacy groups with much fewer resources (and no ad budgets) are also being hugely affected. It's starting to look like Facebook is willing to strangle public discourse on the platform in an attempt to wring out a few extra dollars for its new shareholders. 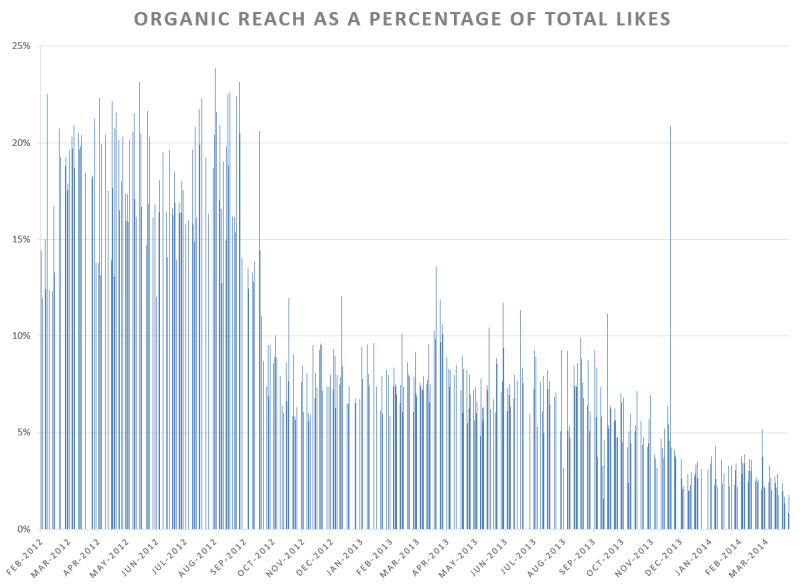 Put simply, "organic reach" is the number of people who potentially could see any given Facebook post in their newsfeed. Long gone are the days when Facebook would simply show you everything that happened in your network in strict chronological order. Instead, algorithms filter the flood of updates, posts, photos, and stories down to the few that they calculate you would be most interested in. 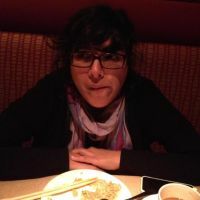 (Many people would agree that these algorithms are not very good, which is why Facebook is putting so much effort into refining them.) This means that even if I have, say, 400 friends, only a dozen or so might actually see any given thing I post. One way to measure your reach, then, is as the percentage of your total followers who (potentially) see each of your posts. This is the ratio that Facebook has more-or-less publicly admitted it is ramping down to a target range of 1-2% for Pages. In other words, even if an organization's Page has 10,000 followers, any given item they post might only reach 100-200 of them. In the case of my organization, that ratio is already down from an average of nearly 20% in 2012 to less than 5% today—a 75% reduction. Another way of looking at it is in terms of what our reach would have been if Facebook hadn't shifted the goalposts. From February to October 2012 our posts reached about 18% of our followers, on average [see graph above]. If that percentage had stayed the same as our followers grew over the past two years, then each item we posted today would theoretically reach about 1,000 people. The actual average for the second week of April? 79. Lots of people have no problem with making Mountain Dew or Sony pay for what was previously free advertising—never mind that Facebook had already encourage them to pay for more likes with the promise that they would be able to broadcast to those followers for free. Nobody needs to shed a tear for the poor souls at Proctor & Gamble who have been forced to rejigger some small piece of their multibillion dollar advertising budget. But Facebook has also become a new kind of platform for political and social advocacy. We may scoff at overblown "saving the world" rhetoric when it comes from Silicon Valley execs, but in places like Pakistan (not to mention in Tahrir Square or the Maidan) the idea of social media as an open marketplace of social and political ideas is taken quite seriously. That all goes away if nobody can even see your posts. In the more prosaic world of nonprofits, Facebook has also become a crucial outreach tool and an effective way to stay in touch with supporters and partners. Many organizations funded by government or foundation grants are not even legally allowed to spend that money on advertising—and many more simply don't have the budget for it regardless. Facebook urgently needs to address the impact that its algorithm changes are having on nonprofits, NGOs, civil society, and political activists—especially those in developing countries, who are never going to be able to "pay to play" and for whom Facebook is one of the few really effective ways to get a message out to a wide audience without government control or censorship. Improving the quality of posts on Facebook is a laudable goal, but it must be done in a transparent manner. For all the gripes people have about Google and their search algorithm, they are very clear about what they consider "quality" content and even provide free tools to help ensure pages have what their robots like to see. An algorithm change that results in a huge swath of legitimate, non-spam users losing 75% of their reach should not be deployed in secret. In the meantime, there are still some social networks that don't presume to know what you want to see in your timeline and will blast every one of your messages to every one of your followers. At least for now. Twitter just went public last November and will need to show a profit someday. B. Traven is a pseudonym. He runs social media for a mid-sized international NGO in Washington, D.C.